Peter Adams, the Development Director for the Midland Metro Alliance and Transport for West Midlands, won a prestigious award for his work leading on the planning of future tram routes in the region at an awards ceremony held last week. The award, presented at the Global Light Rail Awards in London on Wednesday 3 October, celebrates and rewards the most outstanding contributors to the industry. The Judges’ Special Award honours individuals who have made an exceptional commitment to furthering the light rail industry. Peter was recognised for the legislative work undertaken required for bringing light rail extensions from the planning phases, to securing funding and finally into construction. Peter is a Chartered Engineer and a Member of the Institution of Civil Engineers and of the Chartered Institution of Highways and Transportation. He obtained a BSc (Hons) in Civil Engineering from the University of Birmingham and since graduating in 1980, worked for Leicestershire County Council and the Highways Agency before joining Centro (now Transport for West Midlands) in 2002. He managed the development and implementation of West Midlands Metro extensions since 2004 and helped form the Midland Metro Alliance, heading up the Development Team, in 2016. 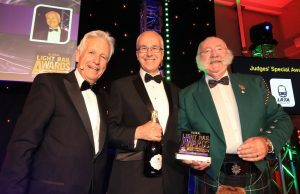 It was also a night of celebration for the region’s tram network all round too, as West Midlands Metro and tram manufacturer CAF were highly commended for innovative battery-powered tram technology. The Midland Metro Alliance was nominated in an additional two categories, including employee of the year in recognition of their Training and Development Manager, Rose Rees, and her work in upskilling local young people and helping to get their careers in light rail construction and renewals on the right track.